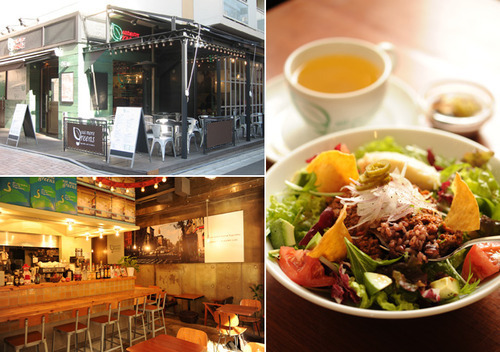 Azabu Juban is home to a wealth of great dining options. Burger joints and classy cafes catering to the large expat population can be found dispersed around town. There are also a number of traditional Japanese restaurants with long histories in the area. The following list gives just a small taste of the many options for dining in the neighborhood. 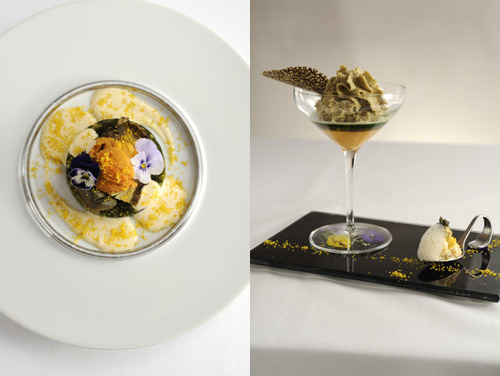 Master chef Tetsuji Koga brings his vast experience in fine cuisine to bear at his latest venture which opened in 2010. Blending classical French cuisine with seasonal Japanese ingredients, the chef offers up his take on “Fraponese” cuisine, which has been gaining popularity in Tokyo in recent years. The dining room is intimate, with dark wood paneling and white stone walls. With a breadth of experience including extensive time in the Napa Valley, the head sommelier ensures that this first-rate cuisine is paired with a wide selection of premier wines to support it. His wine list includes a selection of “bridge wines”, featuring wineries in the “new world” that have maintained the old traditions of wine making from Europe. They offer a lunch special that allows diners to experience a variety of main courses at a reasonable price. Eat More Greens matches tasty vegetarian food with a New York style cafe interior to provide an experience unique in Tokyo. With high ceilings, modern furnishings, and counter seating the restaurant has a hip cafe vibe. For lunch, the place offers fabulous vegetarian taco rice, complete with black soybeans and black rice. In the evening, the restaurant features a vegetarian pasta of the day and a falafel plate among others. Apart from serving up a variety of healthy, vegetable-based mains, the cafe has a great selection of baked goods. The vegan donuts are especially recommended. Japan’s first gourmet burger joint also makes some of its best. A great option if you’re craving a burger with a little more substance than a typical fast food chain’s. The name of the restaurant has nothing to do with every child’s least favorite thing, but refers to its quality “homemade” foods and warmhearted service. The hearty hamburgers they serve are 100% pure beef, loaded with vegetables, and come with a generous helping of French fries. The restaurant serves sandwiches, soups, salads, and other seasonal specials as well. 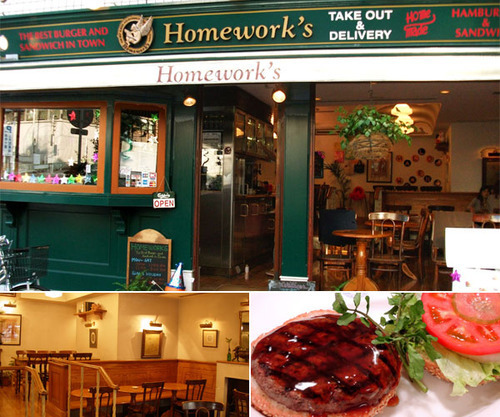 Homework’s also runs a delivery service for those living or working in the Azabu area. The “Shinshu Sarashina Soba Dokoro” first opened in 1789, and has been owned and run by the Horii family for over 200 years. Their Sarashina soba (buckwheat noodle) has retained its popularity over the centuries; at one point it was even delivered to the Shogun family and other feudal lords of old Edo. The original soba recipe has been passed down through the generations, and the establishment continues its centuries-long tradition in Azabu-Juban. 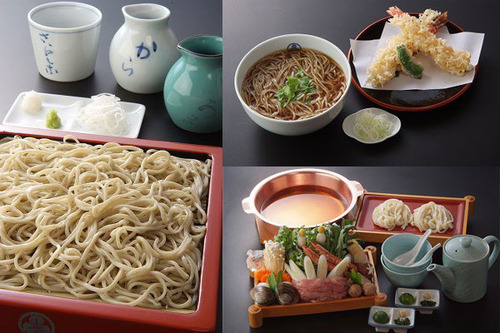 Diners can choose from a variety of handmade soba. One option is the famous Sarashina Soba – a white soba that is made using only the center of the buckwheat’s grain. They also serve tempura and other Japanese foods to accompany it. While the store is now located in a modern building complex, the owners worked to ensure that the shop’s interior still captured that traditional Japanese dining experience. If you consulted Wikipedia, you’d learn that Azabu-jūban is a district of Minato, Tokyo, Japan… and that it is a lively residential area in central Tokyo with a mixture of Japanese shops, restaurants and bars. As is true with most things we research on Google, the truth of this lovely neighbourhood (which I call Azerbaijan because I can never remember the name properly) is much better understood in person. In this case, Azabu-jūban came to life for me via a leisurely walk on a cold Saturday morning in January.